A tow truck driver said the man was trying to start a fire. 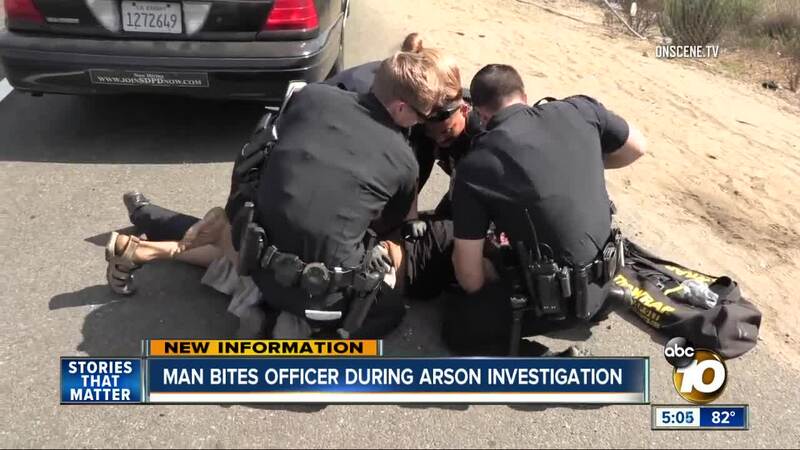 SAN DIEGO (KGTV) - A tow truck driver helped San Diego Police capture a man who the driver said was starting a fire Thursday along Interstate 15 in central San Diego. Police said the tow truck driver reported the man near the 15 and 94 freeways in Mount Hope about 1 p.m.
Officers handcuffed the man and placed him inside a patrol car, but he managed to get out of his restraints. Police said he fought back and they removed him from the car to restrain him again. “The gentleman attempted to bite two of the officers on their hands as they were attempting to place him in the body wrap system,” said SDPD Sgt. Nathan Chambers. Arson investigators who responded to the fire scene found charred wood and grass. There was no evidence of a large fire. 10News asked police if the man is connected to other recent fires in the area but officers said that has not been determined. The man was not charged with arson Thursday.